Steam Butler Pressure Washing Service to Clean Your Exterior Surfaces. Steam Butler Cleaning Services provides pressure washing services to clean your driveway, deck, sidewalk or patio in the Lower Mainland including Vancouver, Richmond, New Westminster, Burnaby, Delta, Surrey, Langley. 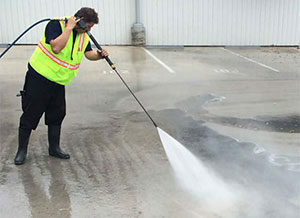 Our technicians have the extensive experience and necessary tools to thoroughly clean the exterior of your office building or home by applying high pressured water to remove dirt, debris and mildew from hard surface areas. We use environment friendly non-toxic solutions to keep your family, pet and lawn safe. Steam Butler Pressure Washing will bring back the clean and spotless surface to your dull and stained driveway. Pressure washing can remove dust, dirt, grease, and many other types of build up from stone, brick, concrete, wood and aluminum siding.